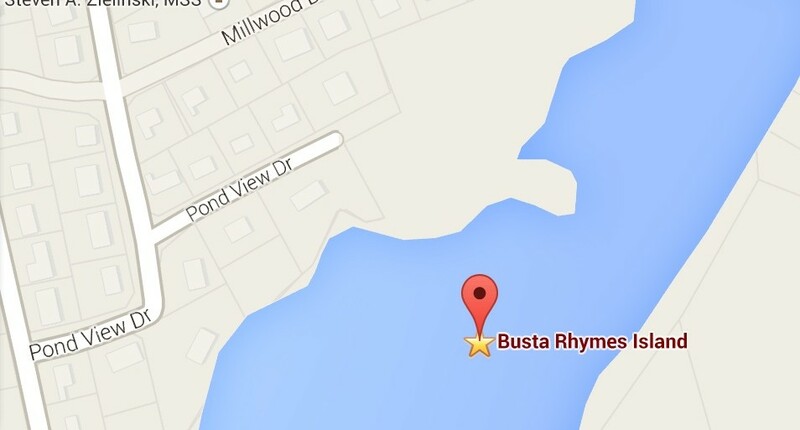 Fighting to officially change the name of his private island to Busta Rhymes Island, American rap-fan Kevin O’Brien has locked horns with the U.S. Board of Geographic Names. 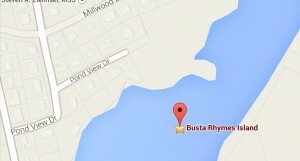 In what at first glance may seem to be an April’s Fool joke come one week too late, Private Island News has received incredible reports of a petition to officially christen a tiny island in Massachusetts “Busta Rhymes Island”. At the heart of the storm is an unsuspecting 16,000 square foot speck of earth tucked away within a mill pond in the tiny town of Shrewsbury, Massachusetts (population 35,608). Once an overgrown dumping ground, the island has been transformed by local resident Kevin O’Brien – a 30-something technical support worker with a huge passion for rap music. Since discovering it during a canoe tour over 10 years ago, the island has become something of a personal for O’Brien, who has taken great pains to clean up the island’s image – removing the hundreds of discarded beer bottles and even planting blueberry bushes to brighten up its appearance. On the quest to take his labour of love to the next level, O’Brien and his friends decided to give the island a somewhat unusual name, christening it Busta Rhymes Island in honour of their favourite rapid-fire rapper – the Brooklyn-based Trevor Tahiem Smith, Jr., a.k.a. Busta Rhymes. Not content with simply geo-tagging the island under its new, musical moniker, the 30-year old set out to get the island’s new name officially recognized by the government, submitting a formal proposal to the U.S. Board of Geographic Names. Unfortunately for O’Brien, however, the U.S. Board of Geographic Names was forced to turn down the proposal. According to the board’s myriad rules and regulations, geographical features are not allowed to be named after a person until five years after their death. The quest isn’t over, however, with a legal loophole offering a possible ray of light for the rap fan. Undeterred, O’Brien is now attempting to make the name stick by means of “local usage” – a quirk of the US Board of Geographic Names which states that if the name can proved be in common use, the denial will be overturned and the name will be reconsidered. In his bid to make Busta Rhymes Island official, an online petition has begun, already gathering a respectable 186 signatures (at the time of going to press). Whilst unclear how many signatures are needed to make the name official, the campaign certainly seems to be headed in the right direction. According to O’Brien, the island is “very small, with blueberries, rope swinging, and stuff Busta would enjoy.” What the Busta Rhymes himself thinks of the campaign is not yet clear. To have your say and sign the petition, be sure to check out Petition Buzz! Alternatively, head over to our Facebook page to tell us who you’d name your private island after.